Welcome to language-easy.org! As you have have clicked on this article about German reflexive pronouns, I think you are ready to enter this rather complicated part of German grammar. Well, maybe the best way to stay positive is to understand the importance of German reflexive pronouns in the German language! So, just imagine you want to brush teeth. Unfortunately, you will not be able to express whose teeth you are going to brush without reflexive pronouns! Well, in order to avoid this risk of brushing another person’s teeth, we will have a detailed look on German reflexive pronouns. In the following, we will try to define this kind of German pronouns, look at tables and examples. Hopefully, you will understand it’s principle and master this important detail of German language. So, let’s start right ahead and clear up what German reflexive pronouns actually are. Viel Spaß! What Are German Reflexive Pronouns? Was sind Reflexivpronomen im Deutschen? First of all, let us try to define what German reflexive pronouns actually are. So, just imagine the case of Peter, an exchange student from the U.K. who lives in Germany. Well, he tries to tell his German exchange family that he wants to wash and go to bed. Actually, it’s quite easy in English to express that. So, he says “Ich werde waschen und danach ins Bett gehen.” Unfortunately, his family won’t know, if he wants to wash himself or maybe his clothes. So, “Was oder wen wirst du waschen?” is what they’re gonna ask her. Well, the point is that “waschen” in German is a reflexive verb. That means, that this verb is always connected with a reflexive pronoun. Unfortunately, reflexive verbs and pronouns are of really high importance in the German language. So, there are a lot of reflexive verbs where the subject and object are the same. Here, a reflexive pronoun has to be used in order to refer to the subject of the sentence. Well, in English you would use ‘myself, yourself, herself’. So, the point is that in German, reflexive pronouns are far more frequent than in English. So, it is really important for you to master this topic. Luckily, mastering this part of German grammar will polish your German and people will understand what exactly you want to wash or brush! Now, we have reached the most important part of this article. 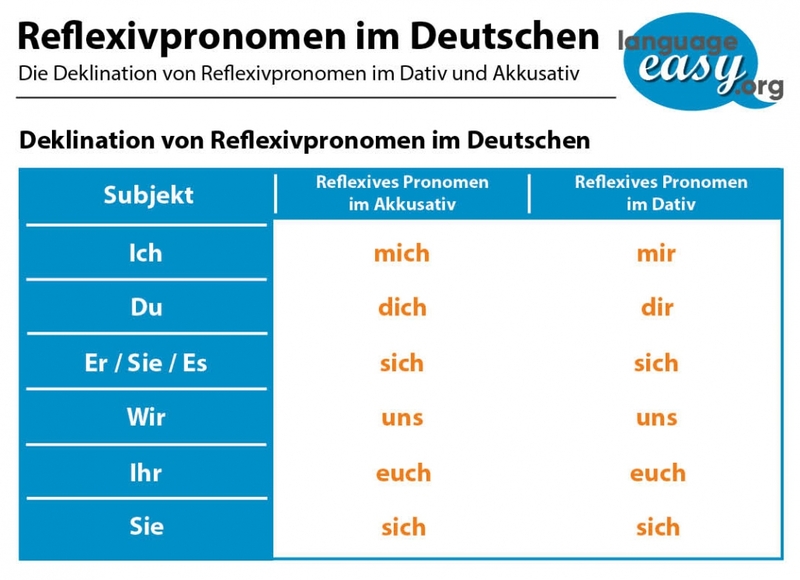 Here, we will have a look at a list of German reflexive pronouns. After that, we will try to illustrate this table by some examples. So, let’s not loose too much time and start right ahead. Well, as I have already mentioned, we will try to use these German reflexive pronouns to form some examples. Of course, you will see that it is not really complicated to apply them as the structure is really similar. “Ich rassiere mich.” – I shave myself. “Du legst dich hin.” – You lay down. “Er/sie/es kümmert sich um den Mann.” – He/she/it takes care of the man. “Wir entspannen uns.” – We relax. “Ihr duschen euch.” – You are showering. “Sie irren sich.” – They are wrong. Hopefully, you could understand the use of German reflexive pronouns. Actually, it’s quite easy in case you know the exact use of reflexive verbs. Well, in the next chapter of this article, we will look at another part of German reflexive pronouns. By now, we have talked about German accusative reflexive pronouns. So, the other German reflexive pronouns are the dative ones. Although this kind of pronouns does not occur that frequently, it is still very important to know and master them. Well, not every single German reflexive pronoun differs from the ones in the list above. Actually, there are only two that differ: The first and second person in singular. So, here they are. “Du ziehst dir die Schuhe an.” – You put on your shoes. Here, the big difference in these sentences between English and German is that in English we would use the possessive ‘my teeth’, in German the reflexive pronoun tells us this information and therefore we simply use the correct article “die Schuhe” (the teeth). Finally, we have come to the end of this article about German reflexive pronouns. For sure, it was not too difficult for you to understand these basic principles. 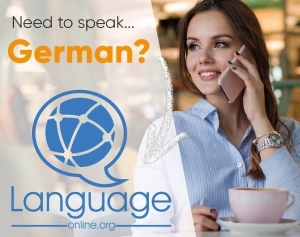 Well, you simply have study German verbs and try to apply the dative and accusative forms in the correct way. So, be careful not to mix up these two forms! Hopefully, this article was of some use to use. So, just in case you want to enter into some more detail about this topic, just have a look at the article on Wikipedia.